In the last article I showed how to create the type of post display I use here at diagrammes modernes. Only the first part of an article appears on the main page, with the entire article following once the reader clicks on "more". This is easy to accomplish and enhances the readability of the site. But it requires that articles are written so that the first part of each stands on its own. What if you want the summary to be different from the article proper? Well, that too is easily done and I'm here to show you how. Edit your template as before in order to put the following style code in the HTML header. If you have already made the changes in the previous exercise there are only two new lines here. As you can likely tell, these styles are designed to alternate the "fullpost" and "summary" layers. You can tweak the margins to your liking. In this case the code at the end of the <div class="post"> layer can be the same as before, or possibly modified to be more explicit. This allows you to style the "more" class as you wish. Each time you start a new article you will need to write a summary in the first div and the full article in the second. It's as simple as that. I do hope this technique will prove useful! I have been asked to explain how I get my articles to show in two parts: an excerpt on the main page with the full post on the article page only. There is more than one way to do this, but the following requires only three easy steps. Please note that if you have made additional alterations to your template this may get more complicated, and since I have made such mods, I don't know if this explanation will work completely or perfectly for all people. Use at own risk. Etc. Etc. This utilises the Blogger tags that restrict which pages code will appear on. On the main or archive pages, layers with class "fullpost" will be styled so that they do not display. On item pages such layers will be displayed inline, with a suitable top margin. Again, edit your template. Somewhere at the end of the <div class="post"> layer you need to add code that displays the "more" link. Like before, this code is contained in Blogger tags that restrict its use to main or archive pages. You can customise the look of this link if you wish. But the important thing to remember is that this will appear for every article. In your blog configuration, click the "Settings" tab and then the "Formatting" link. At the bottom of the page is an area where you can enter a "Post Template". Though confusingly named, the purpose of this is simple. Any new post you author will begin, not with empty content, but with whatever you have here. That's it! You are ready to begin. Each time you start a new article it will begin with the code above. Put any content you want to appear in the excerpt before that div. Put the remainder of the article within the div. The last thing in each article should be the concluding </div> tag. Please note that this does not reduce the size or loading time of your main page, since the entire contents of each article are still present, merely hidden. But it does improve the readability, since the page can be scanned easier for articles of interest. 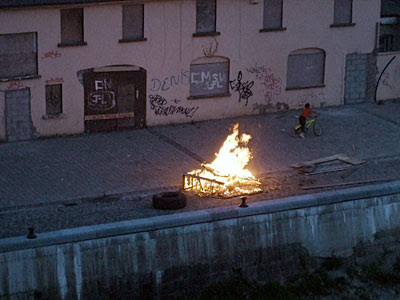 Here in Ireland on May Eve, the night before May Day, it is traditional to build bonfires. Everyone, young an old, can enjoy a bonfire of crisply burning twigs, setting the night aglow in wonderful colours and releasing a lovely aroma of the woodlands into the air. Unfortunately, that is not exactly how things are done in Limerick. 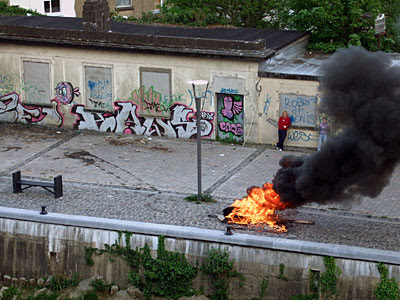 May Eve is now seen by some as an opportunity to burn old mattresses, tires and whatever other junk has accumulated. 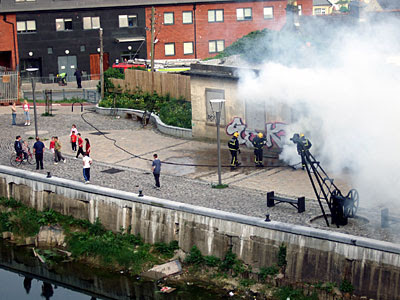 And this is often done right in the middle of the city, in areas where a large fire is a significant safety risk. 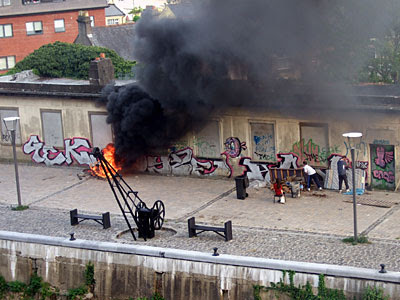 This fire was extinguished after firefighters rapidly answered a call to a blaze on Lock Quay, which is just off the start of the Dublin Road. The smoke was so dense that it was difficult to snap the first picture; it was necessary to wait for a moment when the wind went still so the smoke was not obscuring the view completely. The smell was one of burning rubber and the noxious chemicals were carried directly into perhaps one hundred nearby homes. From the crowd it is evident that this is a family affair. It was mostly children starting the blaze but teens and a few adults stood nearby, far enough away that they could not be directly involved but obviously coordinating, or at least condoning, the action. 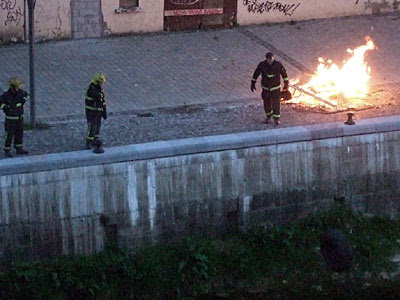 After the firefighters had left a second blaze was started, this one closer to the banks of the canal. While this was far less likely to burn down anyone's houses, the pollution in the air was just as foul. Is this a traditional affair of the seasons? Are people celebrating the oncoming summer? Looking around at the two listless spectators I do not think the fires can be justified in that way. A third fire in the same stretch. It should be noted that this canal-side path has been "revitalised" and has been said by some to be a tourist attraction. It is part of a walking trail that extends to far outside the city. Despite this, a row of derelict buildings has been allowed to remain. The light standards have never been fitted with bulbs, so the area is inadequately lit. The canal itself is full of refuse when it is not merely stagnant water. More than one person has lost their life along this stretch in the past couple of years, and still others have been attacked in the unsafe environment, as it forms the most direct route between the city and an area where thousands live. Firefighters come to the third blaze. But rather than douse it, they merely remove any remaining items that might be burnt. Here they toss a tire into the canal. It should be noted that dozens of other fires could be seen raging about the city, some larger than those photographed here. Undoubtedly the firefighters were overworked and frustrated at having to deal with such petty criminal activity. However, the example they set here will only encourage further destruction of the environment, in a culture which seems to think it quite ok to throw refuse anywhere handy, drink until intoxicated on public thoroughfares and urinate in public. And where were the gardaí on this night? Although called to the initial blaze they never bothered showing up. Activities like these are allowed to continue, taxing emergency workers and possibly placing lives at risk in situations of real emergency. I am a big supporter of Limerick and the arts and culture in this city. As such I am in opposition to this sort of selfish destructive behaviour. Give me a good old pagan celebration anytime. But an excuse to burn your refuse in public? I think not! I haven't had much to say about Samplitude lately, since my own use of it has been relatively minimal and static. Still, the programme marches on, with version 9.02 the latest out of the doors. 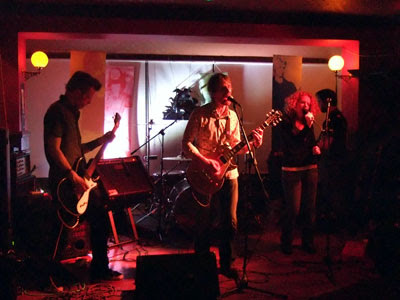 Here's news on a couple of reviews and the brand new line of plugin effects. For the first time Magix has made available some of the lauded built-in effects as VST plug-ins for other sequencer packages. These are three separate products. The Analogue Modelling Suite I've raved about since they were freeware plugins from Sascha Eversmeier. This toolkit includes a compressor, transient designer and channel strip, each designed to get that nice rounded analogue sound. The Vintage Effects Suite includes a chorus/flanger, echo/delay and multimode filter. Finally, VariVerb Pro is a reverb that's been getting rave reviews. These are priced at €199, €119 and €199 respectively. Buying all three will hence set you back €517 of the €999 full price of Samplitude Professional. But no-one ever pays that sum when you can cross-grade from older versions of competing products for €599. Hmmmm, should I shell out for just the effects or spend €82 more for the best multi-tracker on the planet? Let me think! In the January issue of Sound on Sound there's a review of Samplitude 9, currently only available to subscribers. Ken Morgan has a review of Samplitude Professional 9.01. You'll have to scroll down the page or search in order to find it.